Pebbles from a nearby riverbed form a chunky cobbled floor in the entrance to the new Muzeum Susch in Switzerland, as if a tributary once flowed through the building. Maybe it still does. The sound of dripping water can be heard coming from the end of a corridor, where a shiny trickle snakes down a bare rock face. There are other strange things going on. Peer through one opening and you find a gnarled column of earth plunging down into the basement, as if it’s the remains of an archaeological dig. Another passage is encrusted with viscous white goo, forming stringy stalactites that lead to a curious cave downstairs. In this beguiling new gallery in the Engadin valley, it is hard to tell where nature ends and artifice begins. 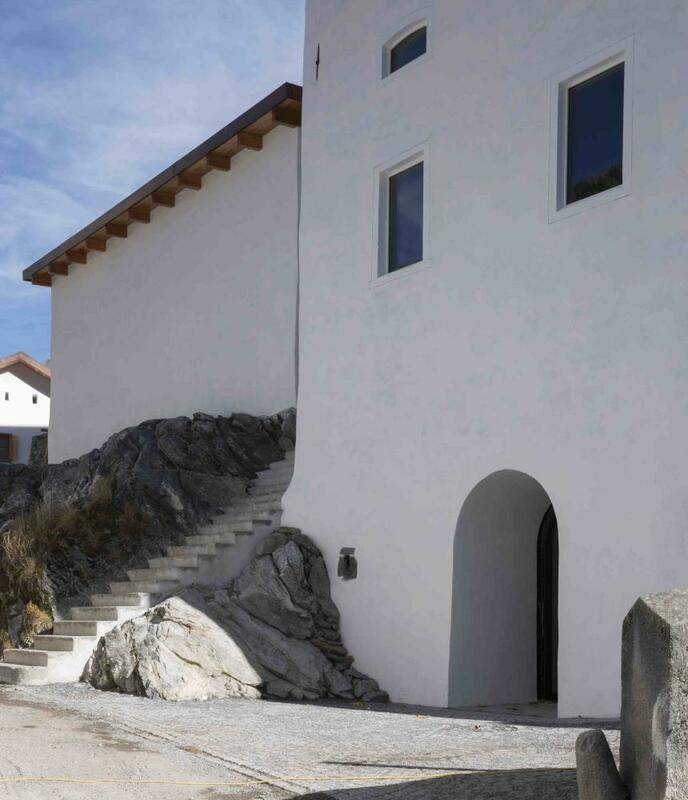 It is located on the site of a 12th-century monastery, in a rambling complex of buildings that formerly housed a vicarage, hospice and brewery, and the young architects Chasper Schmidlin and Lukas Voellmy have concocted a magical place where the historic fabric, contemporary art and the raw geology of the landscape collide. The project is the brainchild of Grażyna Kulczyk, former wife of the late billionaire industrialist Jan Kulczyk, and one of Poland’s richest women. A 68-year-old with a platinum-blond bob and a fondness for skin-tight leather, Kulczyk has been collecting art since she was a law student in the 1970s. She has amassed an impressive haul, predominantly focused on female artists, which she describes as a “matrilineage through global art history”. In 2004, Kulczyk established an arts and retail complex in a former brewery in her hometown of Poznań, but sold it in 2015 to concentrate on this Swiss outpost, after plans for a base in Warsaw fell through. 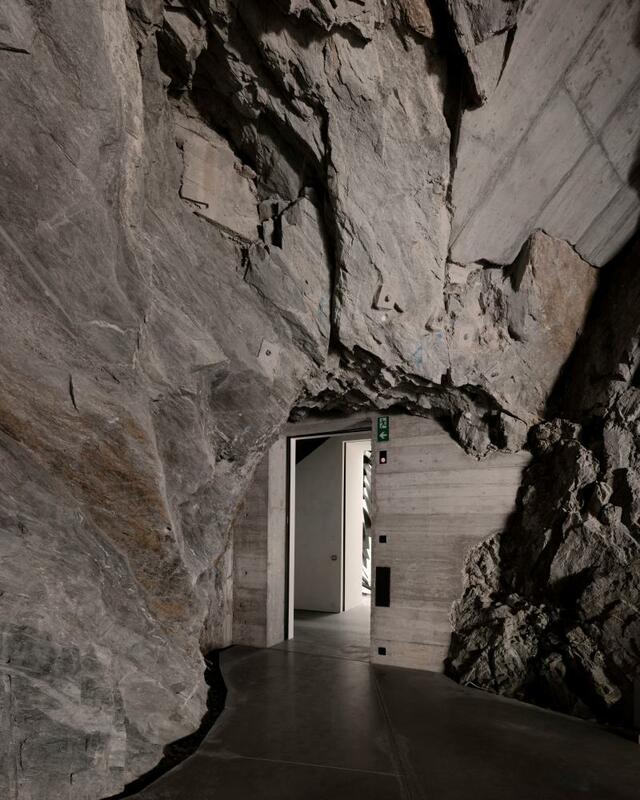 The resulting combination of deep-pocketed patronage and Swiss precision is one of the most exquisitely crafted private museums realised in recent years. From the outside, you might be hard-pressed to differentiate the building from any other white-rendered house in Susch. But step inside and the place unfolds as a Tardis-like warren of rooms, leading you from vaulted basements to airy timber lofts and galleries excavated from the mountainside – a process that saw 9,000 tonnes of rock blasted out. It is alpine chalet, primitive grotto and Bond villain’s lair in one. The sleepy village of Susch might seem like an unlikely place to find such an institution. It’s a tiny hamlet with a population of around 200, whose other main feature is a clinic for people suffering from burnout syndrome. But, just a short drive from the gilded playgrounds of St Moritz and Davos, the site isn’t quite as odd as it seems. The museum joins a growing gallery scene that has mushroomed over the last few years to service the area’s wealthy cultured visitors, in search of more than the usual après ski. There are now more than 30 galleries in the Engadin, with Hauser & Wirth joining the party last year. To make it stand out from the commercial galleries, Kulczyk says she has conceived the museum as more of a “laboratory”, where a series of permanent site-specific installations by the likes of Adrián Villar Rojas (the stratified column) and Sara Masüger (the gooey cave) will complement a programme of rotating exhibitions. Launching with a feminist bang, the opening show – titled A Woman Looking at Men Looking at Women – explores female representation, sexual emancipation and the subversion of traditional gender roles, mixing work from Kulczyk’s collection with international loans. Given that Switzerland was the last European country to give women the vote (with one canton holding out until as late as 1991), the rooms of powerful female forms and gaping yonic voids are a welcome provocation. Without overwhelming the art, it is the building that is the star of the show. Schmidlin and Voellmy, both in their 30s, with one other small gallery in Basel to their name, have struck a brilliant balance between preservation and intervention, amplifying traces of the buildings’ former lives while creating new spaces that are very much their own. The project shows incredible attention to detail throughout, standing as a testament to local craftsmanship and the architects’ ability to deploy a limited palette of materials in unexpected new ways. They have used gravel dredged from the riverbed to make a coarse grey plaster, moulded over the existing masonry like thick icing on a lumpy cake. In other spaces, the rock from their excavations has been ground down and used to form floors of dark polished terrazzo, which spills through the excavated galleries as if it were an oil slick. The material alchemy continues with the use of local larch trees, felled and sliced into 12-metre long floorboards, laid so precisely in one room that it looks like one seamless mat of timber, poured from a vat. Set across multiple levels of sloping hillside, the exhibition spaces range from the crepuscular to the light-flooded. 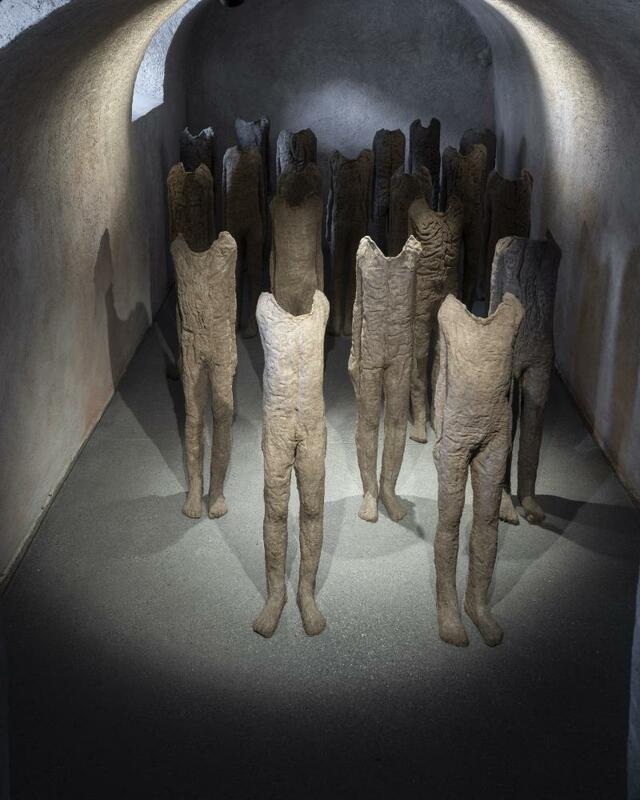 A narrow staircase leads down a former slot between two buildings to a vaulted basement, where Magdalena Abakanowicz’s moulded hessian figures stand like ghosts in the gloom. Upstairs, a former hay loft has been converted into a double-height auditorium and performance space, with huge picture windows that frame postcard-perfect views over the snowy valley. There are constant reminders of the past. Some ceilings are still charred from the beer brewing process, while the former stable block has a manure gutter running through the floor to a low-level window, and a hefty stone watering trough repurposed as a plinth for an archive display. Meanwhile, a triple-height space, once used as an “ice tower” to cool the brewery in summer, has been transformed into an enormous light-well, where Monika Sosnowska’s mangled steel stairs now hang like crumpled ribbons – perhaps a wry comment on where less imaginative architects might have placed a “feature” staircase. But the real drama is found in the bowels of the former brewery, where a storage cave has been enlarged to create a subterranean exhibition space worthy of Ernst Stavro Blofeld. A polished steel cylinder by Mirosław Bałka rotates slowly in the centre of the cave, adding to the sci-fi theatrics, while more water trickles down from the jagged rocky ceiling. It is a fittingly stagey prelude to what comes next: a black-walled concrete bunker, where 200 spot-lit portraits of Nazi generals line the room, their monocled faces and toothbrush moustaches glowing from the walls with camp horror. The controversial work of Polish artist Piotr Uklański (whose similar pieces have forced exhibitions to close in the past), it mocks the ridiculous kitsch of the Third Reich. 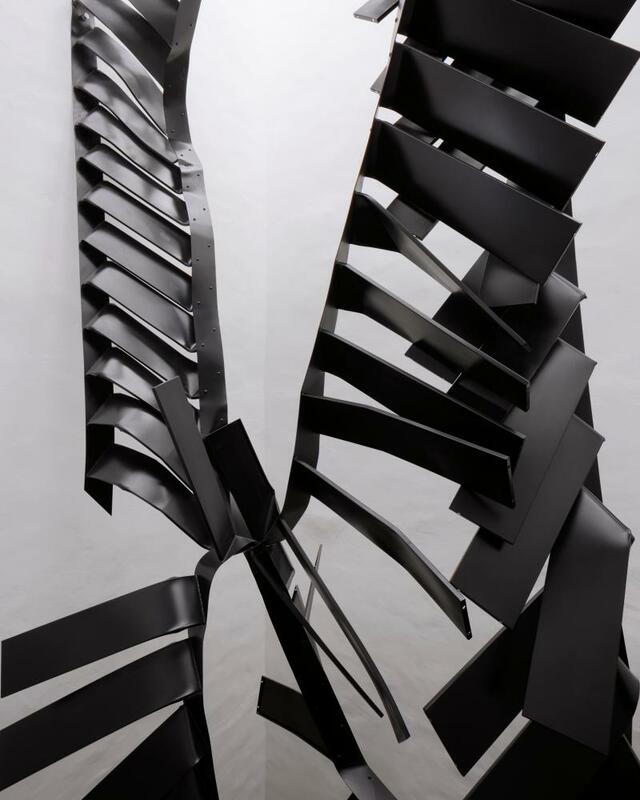 Some of the art might be shocking, but the most lasting impact from visiting Muzeum Susch is a revelation of a different kind. In this era of design-and-build bodging, when architects are often sidelined and contractors cut corners, buildings can still be made this well.